Here is the companion layout that I created to face the “Sweet & 6” layout in an album I am working on. 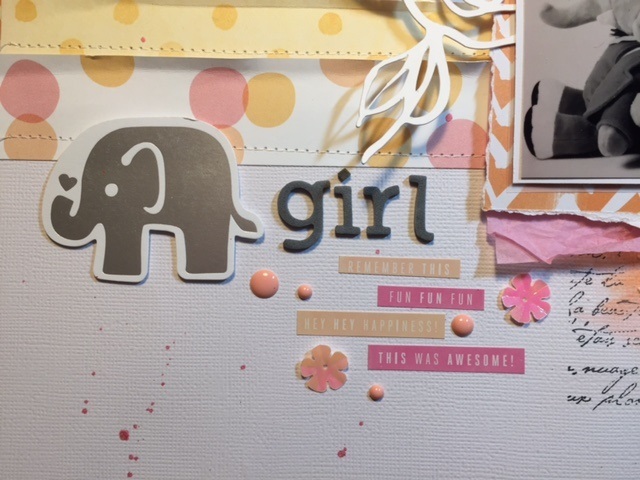 I love the colors in the layout which were inspired by the March and April Hipkit products, especially the Elle’s Studio Cienna Confetti paper and the Amy Tangerine Rise and Shine products. 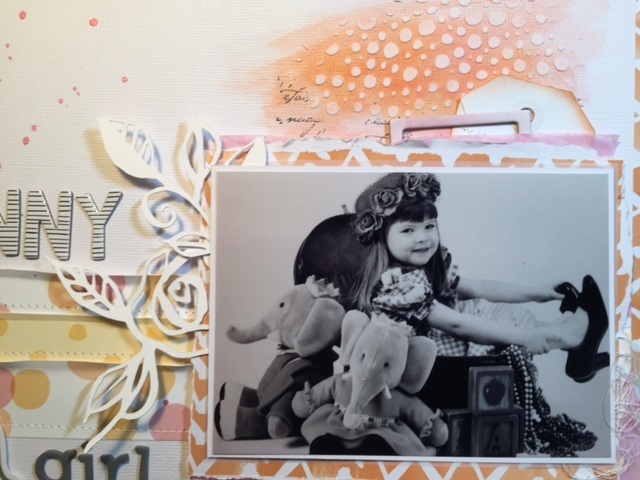 One of my favorite things to do on any layout is to use some mixed media. 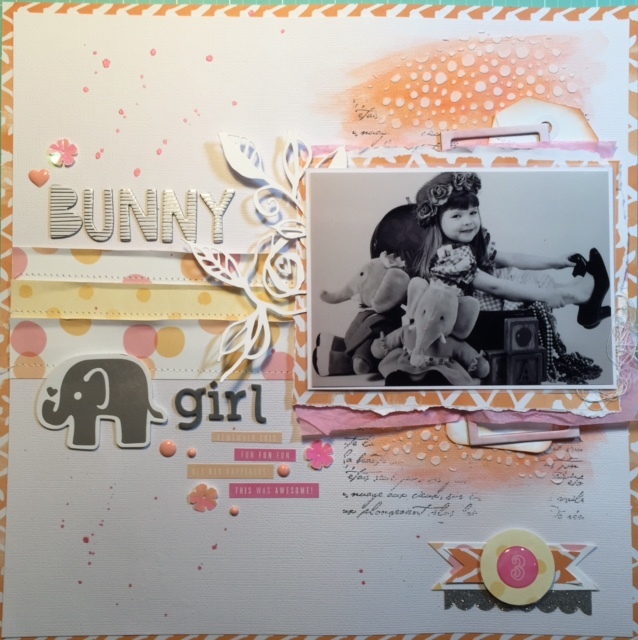 I love texture paste and mists…anything that adds some pizzazz 🙂 I wanted this layout to be fun…this was such a fun time in all of our lives. The kids were not quite at the age yet where we were running in twenty directions at one time with all of the things they were busy doing. Lots of fun!! American Crafts white cardstock, Amy Tangerine/American Crafts patterned paper, Amy Tangerine Stitched paper, pink tissue paper, Wilna Furstenberg cut files, Amy Tangerine Rise and Shine Ephemera and epoxy sticker, Amy Tangerine Alyx thickers, Amy Tangerine Rise and Shine word phrases, Ranger Texture Paste, Faber Castel Gelatos (orange and pink), Heidi Swapp journal chipboard frame and pink Color Shine, Stampin’ Up! 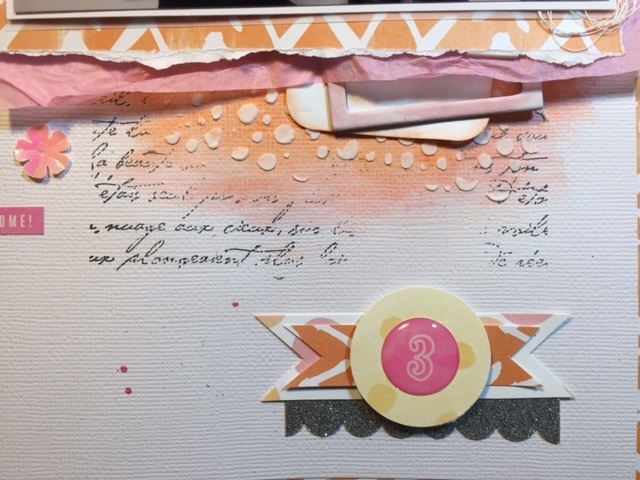 French Script stamp and Groovy Guava ink, Maggie Holmes sequins, My Mind’s Eye On Trend enamel dots, and American Crafts Darling thickers. I love your blog and your you tube videos. I especially love the layering that you do with your layouts. It’s so much fun to watch the process that you go through to achieve the beautiful results with all your layouts. I look forward to the next one. The sound was really good.